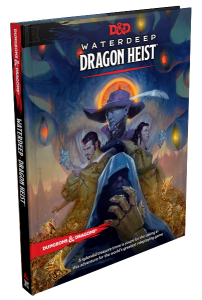 Waterdeep: Dragon Heist is an epic fantasy adventure for Dungeons & Dragons, written by Christopher Perkins, James J. Haeck, James Introcaso, Adam Lee, and Matthew Sernett and published by Wizards of the Coast. I have always found it difficult to come up with something for my PCs to accomplish when they are in big cities. Usually it always lands on an interaction at one of the taverns that leads them to leave town on some sort of fetch quest…never lingering around town. Adventure is supposed to be out in the wide open land, not stuck in town. Waterdeep: Dragon Heist changes this narrative for me! Waterdeep: Dragon Heist is Dungeons & Dragons new adventure book designed to take PCs from level 1 to 5 in the urban setting of Waterdeep. It’s a race against time as your band of adventures are on the hunt for a massive stockpile of gold, hidden within the city. And, what’s that, as the DM I get to pit the adventures against one of four high powered villains? Yes please! So of course I had to get my PCs involved immediately. Even though they are high level, the premise of the adventure was easily adaptable. Add a few levels, a few legendary power sets, and the adventure was a go. They really enjoyed the change up from the routine… adventuring and investigating in a large city instead of just shopping and moving on. If you’re a new DM, this set is a great jumping in point. Dragon Heist provides a huge setting full of exploration. The book provides so much information to help bring the city to life. There are so many fully fleshed out NPCs with so many story hooks, PCs will have plenty of distractions on their hunt for gold. Overall, I found it to be a great addition to my library and one that I will be referencing a few times.